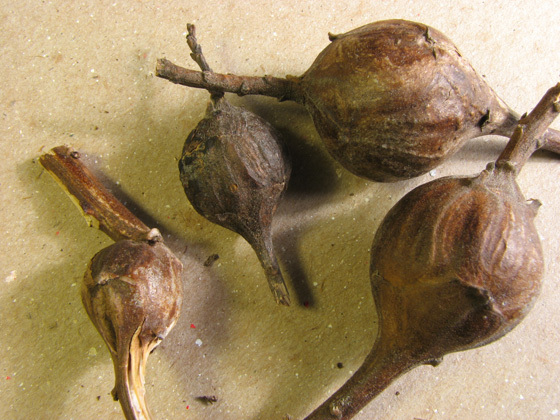 Goldenrod round galls come in different sizes. Apparently the smaller ones get attacked by parasites more often than others; but the larger ones attract the hungry eye of chickadees in winter. So there are two opposite selective forces at work. Is that from your own experience or have you read about it somewhere? I can think of a couple of possible explanations, but I wonder if you know what the real reason is. I got some of the info here and in other sites listed on the info page. Unfortunately the one published by the Minnesota State U. is not available right now. I wonder why. In additon to these galls I have a couple of larger ones with the characteristic chickadee's damage if you are interested. I wasn't sure if it was right to submit them to Bugguide.